You’ll Poke Your Eye Out! This was The Ultimate Christmas Tree decoration. 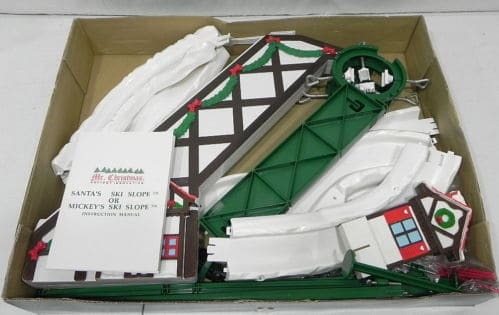 Every year, my dad would pull out all of the pieces, lay them all around the living room, and start assembling this major Test of Christmas Spirit. You see, every year, there would inevitably be at least two pieces missing. At least two other pieces had broken the year before. And on most years, the tree was too big for the little Ski Slope to wrap around it. So, every year, we took at least 4 trips to Target to wait in the ever so long Customer Service line, get the needed parts for the year, listen to dad grumble about the price, and head back home to finish the construction process. By this point in the game, my brother and I had lost interest and went about our business. My dad would spend hours upon hours on the floor trying to get this [insert any number of colorful words here] toy to work. The slope had to be connected just right (usually with duct tape by the end of it), the ski lift had to be clear of debris (and dog slobber), and all the supports had to be level on the floor (while dodging the Christmas tree skirt + presents). A very tall order indeed. At about 6, just as his sanity was waning, the blooming thing would magically start to work! It was as if God had pushed him juuuuuuust far enough to make him really get pot-committed and HAVE to assemble the thing but not far enough for him to completely lose his mind and light the whole thing on fire. 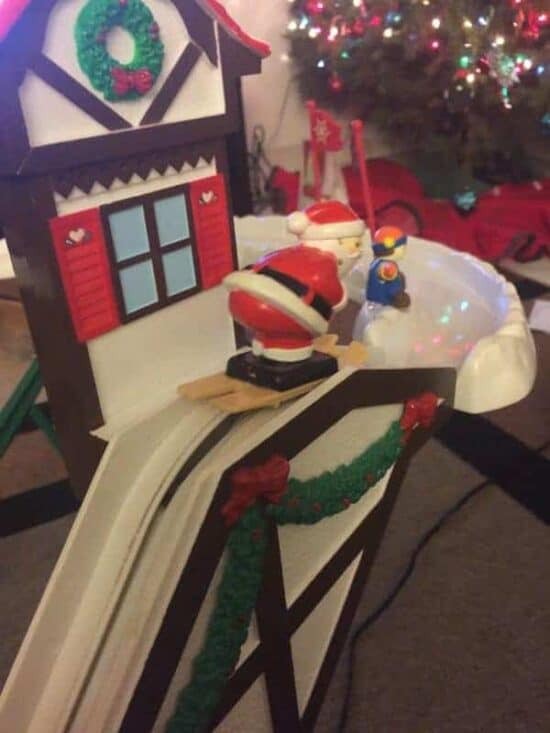 Once Daddy-O had accomplished his mission, good ole Santa there and his little buddies would ride the ski lift up to the top of the slope, you’d hear that ever-so-satisfying ‘click’, and then SWOOSH! Down came the biggo red guy all the way around the tree only to get scooped up on the lift and do it again. It may seem like an easy, simple machine. 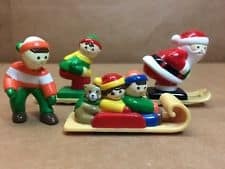 But I assure you, this Santa Ski Slope is the source of many, many of my life’s lessons on patience, humility, and verbal expressionism. These characters here are etched in my memory in the most beautiful, hilarious, warm-and-fuzzy filled way. When we moved just last year, we had to finally say good bye to Santa’s Ski Slope. I held on to it for years with the notion that ONE day… ONE day I was going to get the thing to work again. I decided to let Daddy have all the glory instead. I heard from a little elf that Santa is bringing Corey his very own Polar Express Choo-Choo Train to go around our tree. I’m hoping with every ounce of my being that Jon Boy and I will ultimately spend hours on the floor fiddling with the thing, muttering every ounce of frustrated loathing at the thing that we can, all to see the joy on Corey’s face every time it sparks to life again. That’s the joy of the season, after all. What was your ‘toy’ that you just haaaaad to have on Christmas? Was it something like this annual display of madness and frustration? Or was it something Santa brought you that rocked your world? I’d love to hear!